Maynard “Sam” George was a Canadian Indigenous rights activist who played a crucial role in forcing the judicial inquiry over the attack on Indigenous protestors at Ipperwash Provincial Park. Sam George was born in Windsor, Ontario on July 1, 1952. His father and mother both served in the Canadian military during World War II, but were forced off of the Stoney Point Reserve by the Canadian government in 1942; the government expropriated the land from the Reserve to create a military camp. On September 4, 1995, a group of Indigenous protestors began demonstrating in Ipperwash Provincial Park to draw attention to the decades-old land claims that forced the George family and many others off the Reserve. Among the protestors was Dudley George, Sam’s brother. Dudley was killed during a standoff with the Ontario Provincial Police on September 7, 1995. The event would later be referred to as the Ipperwash Crisis. Sam and other members of the George family called for the Ontario government to launch an official inquiry into the events of Ipperwash. George persisted for years, and a public inquiry began on November 12, 2003. The final report of the inquiry was released on May 31, 2007. Thanks to George’s persistence, the actions of the OPP at Ipperwash were officially acknowledged and on May 28, 2009, control of the lands was returned to the Kettle and Stony Point First Nation. George was named to the Order on Ontario in 2008. On June 3, 2009, Sam George died of of pancreatic and lung cancer. Edwards, Peter. One Dead Indian: The Premier, The Police, And The Ipperwash Crisis. Stoddart. 2001. Edwards, Peter. 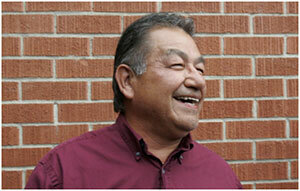 “Sam George, 56, pushed Ipperwash Inquiry”. Toronto Star. Jun. 3, 2009. Web. Accessed Feb. 13, 2018. Marshall, Tabitha. “Ipperwash Crisis.” Canadian Encyclopedia, The. Web. Accessed Feb. 13, 2018. Reinhart, Anthony. “Sam George: Relentless in his pursuit of answers”. Globe and Mail. June 3, 2009. Web. Accessed Feb. 13, 2018. “Sam George receives Order of Ontario”. Province of Ontario. November 20, 2008. Web. Accessed Feb. 13, 2018.